In this TechNote we will provide step by step guidance of how to setup WAS with LDAP realm to install Jazz Server including discussion on Application Server LDAP Configuration, LDAP filters and verifying LDAP connection. Jazz uses J2EE container managed authentication for login and system permissions. 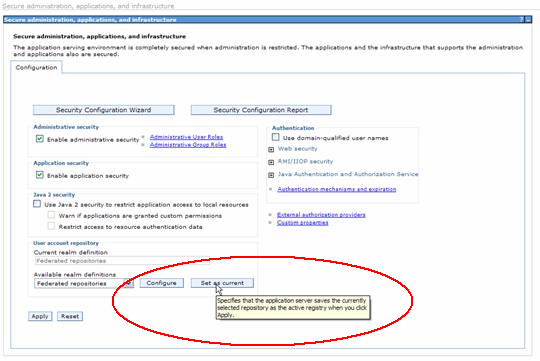 In order for application security to work, you must configure a realm with the application server. While file based realm is generally OK for testing, the LDAP realm is recommended for production deployment. In this section we will show how to setup and configure LDAP realm. In order for Jazz to authorize a user authenticated by the application server, the user must be a valid Jazz repository contributor. Jazz is shipped with a bootstrap user called ADMIN pre-configured in the database. However, unless ADMIN / ADMIN is a valid set of credentials in the LDAP repository being used by WebSphere Application Server, you will not be able to login to Jazz after installing on WebSphere. To avoid this issue, we will add at least one valid LDAP user as a Jazz repository contributor BEFORE configuring the security of Jazz on WebSphere Application Server using the Jazz setup WEB UI interface under User management tab. The pre-configured ADMIN user is pre-created in the Derby database. If you either use DB2, Oracle, your own instance of Derby or any other database, please make sure to run the “repotools” command to configure the data. For the instructions on how to run the “repotools” command please follow the instructions here. WebSphere Application Server LDAP configuration varies based on your particular LDAP server and schema. Before modifying your WebSphere LDAP configuration for Jazz, you should ensure that basic WebSphere LDAP functionality is functioning correctly. 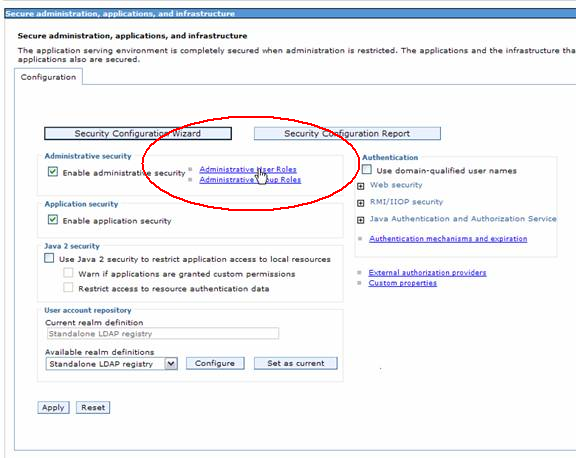 For complete information on configuring WebSphere Application Server for LDAP authentication, see the WebSphere Application Server InfoCenter article, Configuring Lightweight Directory Access Protocol user registries. If your LDAP server is configured with Secure Socket Layer (SSL), you first need to retrieve the certificate from the server . For LDAP setup , choose Standalone LDAP registry. When selecting the Realm to configure Set as current button needs to be activated in order to save this option. Press the Configure button to go into Realm Configuration Screen. Port is the LDAP anonymous connection port. If SSL is enabled, the default port is 636, if SSL is not enabled, the default port is 389. 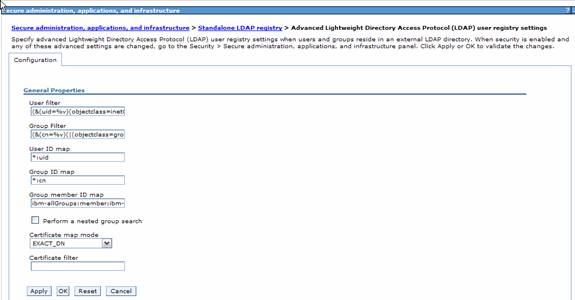 Then click on Advanced Lightweight Directory Access Protocol (LDAP) user registry settings on the right. Specify the user and group filters. For our purposes, the User ID map is important because this is the representation of the user that will be passed to Jazz. 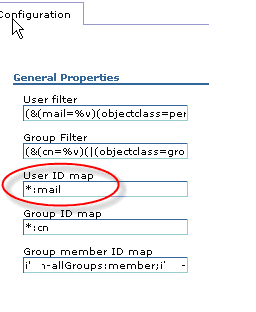 This attribute must match the userid that we created in the Jazz repository previously. Click Apply, then Save the master configuration and restart the WAS process. In this section we will show how to assign roles and permissions to the users loaded from LDAP server. It is an important step in the LDAP deployment to setup users from LDAP with proper permissions in WAS before application deployment. 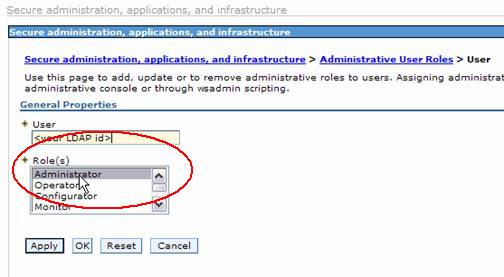 In order to do so click on Administrative User Roles button from Secure administration, application, and infrastructure screen. Grant the user appropriate permissions. The click on Apply and Save. Ability to assign a user role verifies that LDAP is setup properly and users are correctly retrieved. In this section we will show how to assign roles and permissions to the groups loaded from LDAP server. This step is optional, however it verifies that the group filter is setup properly and the Jazz application will be deployed and started without any Group permissions related problems. 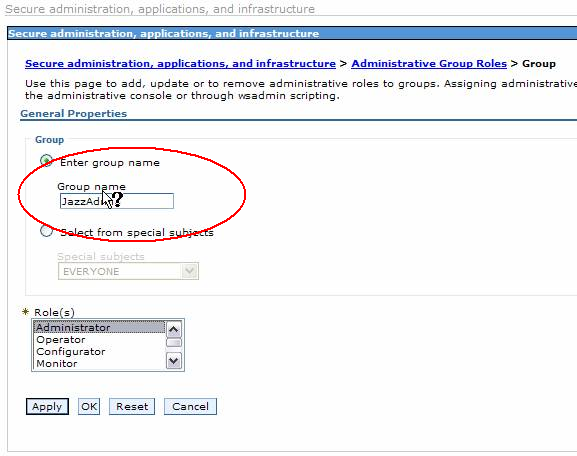 On the Group Roles screen use Add button to query for groups from LDAP Make sure that you choose the existing user group from LDAP and successfully assign a role to it. In case of success, you should see this message. Ability to assign a group role verifies that LDAP is setup properly and groups are correctly retrieved. Once you completed LDAP Realm setup and restarted the WAS server, you have to login into WAS admin console using valid LDAP user/password. You can verify the value returned by the User Id map by looking at the Welcome message at the top of the WebSphere Application Server Administrative Console. 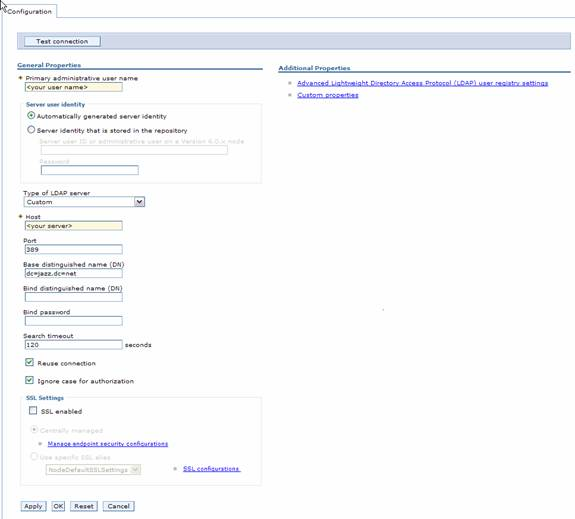 WebSphere Application Server Administrative Console to return an appropriate value.